I leave for work a little after 6:00am, and by the time my break rolls around at 9:30 I'm ready for a breakfasty snack. 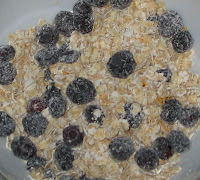 Fruit is good, but having access to hot water made me think of instant oatmeal, the kind that comes in little packets flavored with yummy maple and brown sugar. 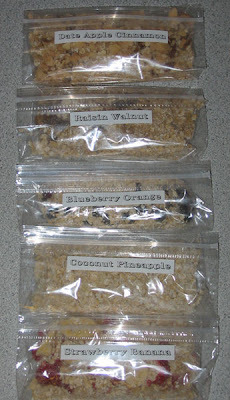 So, I decided to try making my own instant oatmeal packets! 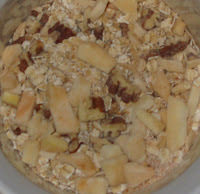 I have many more ideas: dried cherries, coconut, and chocolate chips; dehydrated pears with sugar and a pinch of mace or cardamom; dried peaches with sugar and powdered soy milk or powdered rice milk . 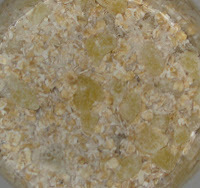 I could even buy maple sugar and make maple-brown sugar oatmeal. At work I can put the instant oatmeal in my little mug, add about 2/3 cup hot water, and let it sit for 2 minutes. A perfect mid-morning snack!